Man when I fall off the daily blogging wagon, I really fall off. It’s been what? A week at least! Sigh. Guess it’s time to retire the “365 days of Sara” tag. Too bad because that had a certain ring to it. Finally got around to buying those new shoes I meant to pick up sometime before the half marathon last month. I’m a LunarGlide devotee because they’re the only shoes I’ve worn that have let me run relatively injury free (no this is not a paid endorsement). Not sure why, but there is a serious Nike LunarGlide shortage in this city. I haven’t been able to find a single store that has any in stock let alone any in my gigantic foot size (9.5!!). 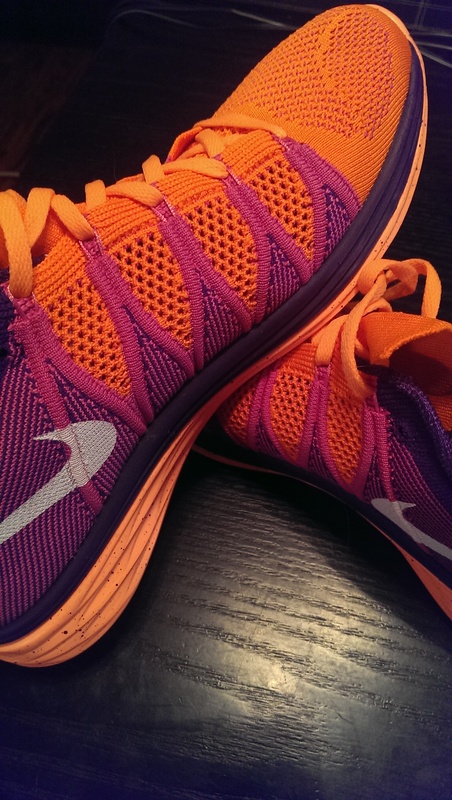 So I bit the bullet and decided to try a slightly different shoe in the same product line – the Nike Lunar Fly Knit. Tried them this morning for the first time after a week off for a pulled calf muscle. So light! So springy! I did a quick 10.5K and it felt like my feet barely hit the ground. Very responsive and supportive without constraining the foot. I can’t wait for my long run on Saturday to really test them out. Also, so pretty! Check these bad boys out! I feel faster just looking at them! Highly recommend you look at these shoes if you’re thinking about picking up a new pair. And as a runner, when are you NOT wanting to pick up a new pair? Hey!!! Nice shoes!! I love them!! So pretty!! Hope you’re having a great weekend!! XOXO! !